Posted the below as is on a popular web skiing forum that may amuse some on this board. The noted previous storm was 91 inches over several days. I have the Epic Tahoe Local Senior Pass. Used 2012 Rossignol S7 skis that are 173cm long and 110mm at boot. 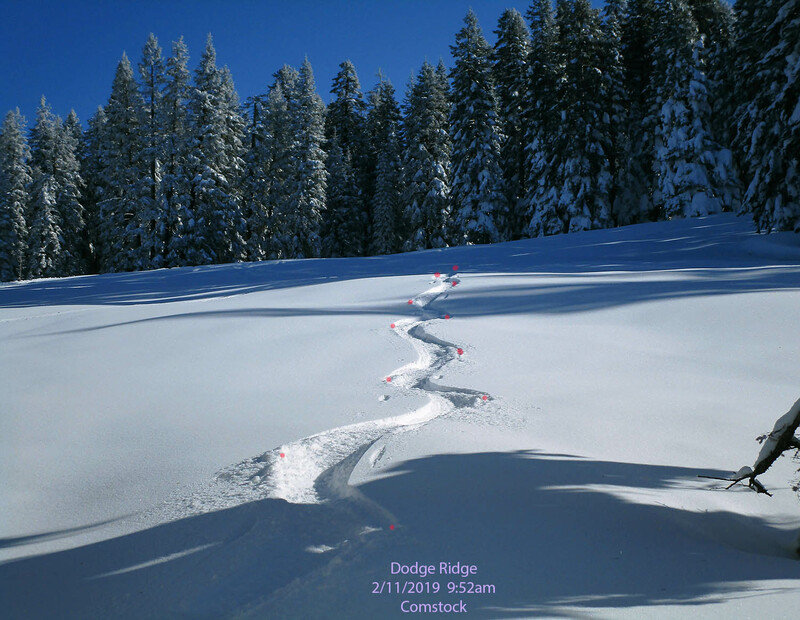 After fresh powder skiing Dodge Ridge on Tuesday February 6 after the massive storm series waned and then a couple days days bump skiing at Heavenly, I drove home to recover 3 days as yet another large very cold storm dumped on the Sierra Nevada. With another large storm set to move in Tuesday pm 2/12, I decided to just get in a single day again at Dodge Ridge on Monday. The resort had been open Sunday 2/10 as 31 inches fell over 2 days with sub-freezing temps always clouded, however Chair's 7 and 8 had remained closed so most of the mountain remained untracked. Thus began my 165 mile drive at 5:12am, picked up a $56 senior voucher in Sonora, and arrived at the resort parking lot about 8:40am while encountering few vehicles on SR108 beyond Sonora. A gal and her daughter at the SaveMart related Sonora schools were off on a snow day so that meant there would be plenty of skiers and snowboarders on slopes. Skies were very deep blue sunny with temperature 18F but would rise quickly into low 30F's by afternoon. Images below were shot with my tiny 4.7ounce Canon Powershot ELPH 900 point and shoot camera. I didn't take pictures of most of my untracked lines this day usually because of poor perspectives, contrasty sun plus tree shadows, and the enjoyment of just skiing the lusciously soft snow without stopping. 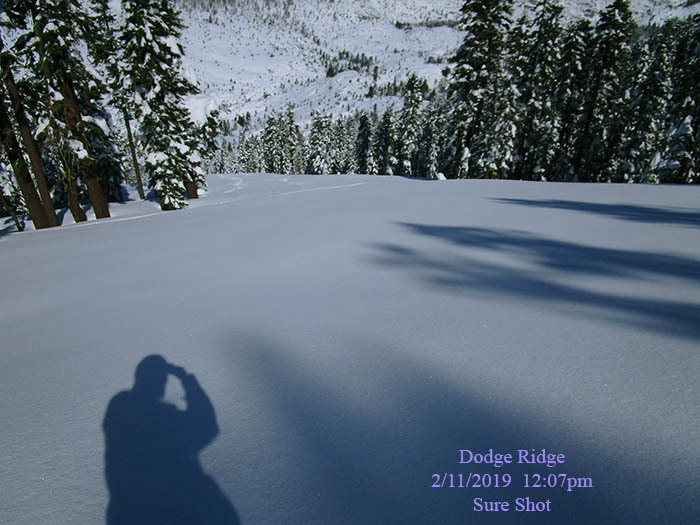 The snow level was about 2500 feet versus 1400 feet during the previous storm so the fresh snow though slightly less light was still exceptional given the usual 6k Tahoe snow levels. Like most others, I immediately began riding chair 7 a long slow fixed grip triple chair that runs at a west to east orientation between 6980 and 8145 feet. Because Chair 8 that runs on the other side from 8145 would be closed till late morning. 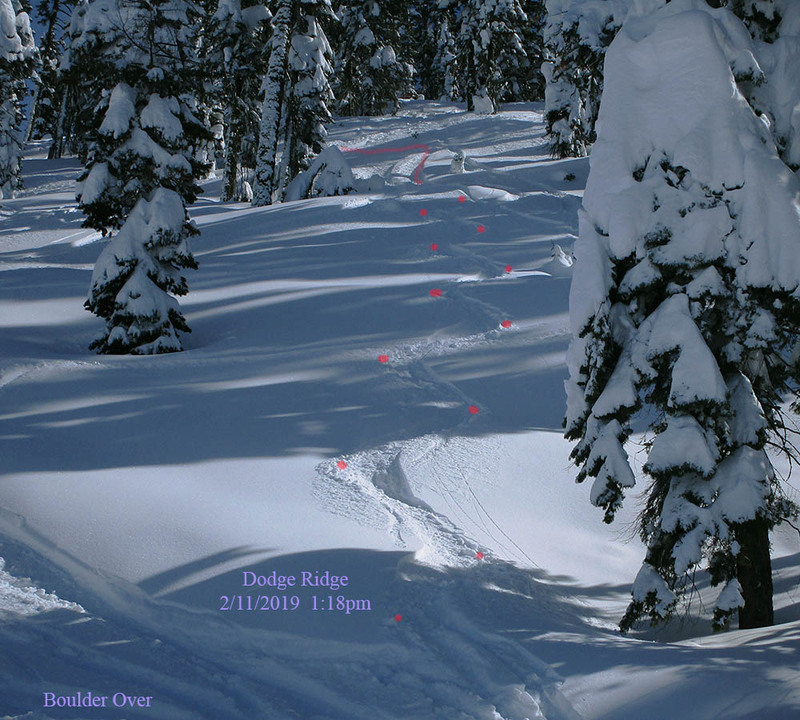 I took the groomed Stampmill trail that routes along the ridge at the resort's south perimeter tracking in the ungroomed edge and then at 9:52am bounced down the above picture slope above Comstock. On my second lift ride took Quicksilver down some and then into the woods popping out at 10:15am in this wide open area per above. The nature of Chair 7 runs is they converge lower thus closer to the lift was tracking out quickly. 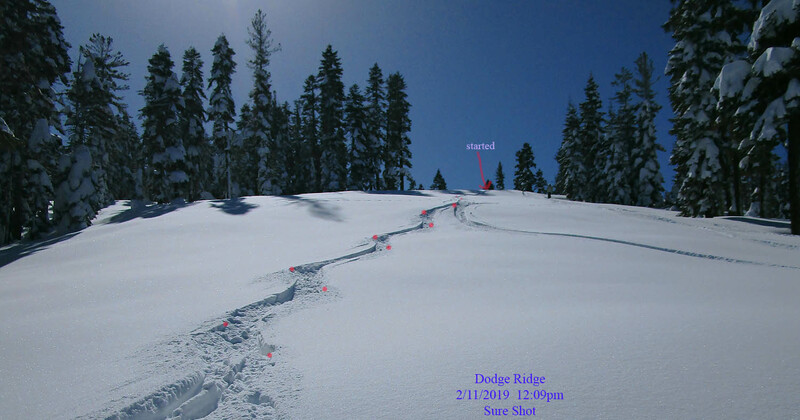 This next image above after my third Ch 7 ride is off Stagecoach on a sunny south facing slope of the ridge. 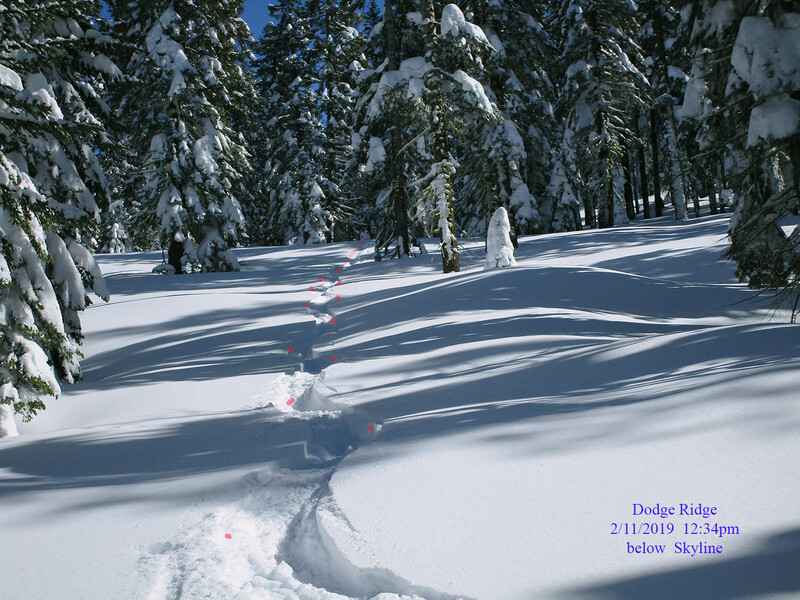 Snowboarders and skiers that are not able to ski powder fall lines were instead making many diagonal cuts across these forested slopes. This was the last run on these slopes because the sun was quickly melting the surface. On my next run in fact, I picked up water on my ski bases that immediately froze upon entering cold snow in shadows making skiing near impossible. Back down near the lift I then spent several minutes with skis off scraping off the ice with ski edges. Finally about 11:20am, Chair 8 opened though road to the Shots was still closed. I immediately went into the Forest to reach groomed Creekside in order to ski a wonderful line through forest down to High Noon at the lift. My line began well beyond the top of the red line in those trees. 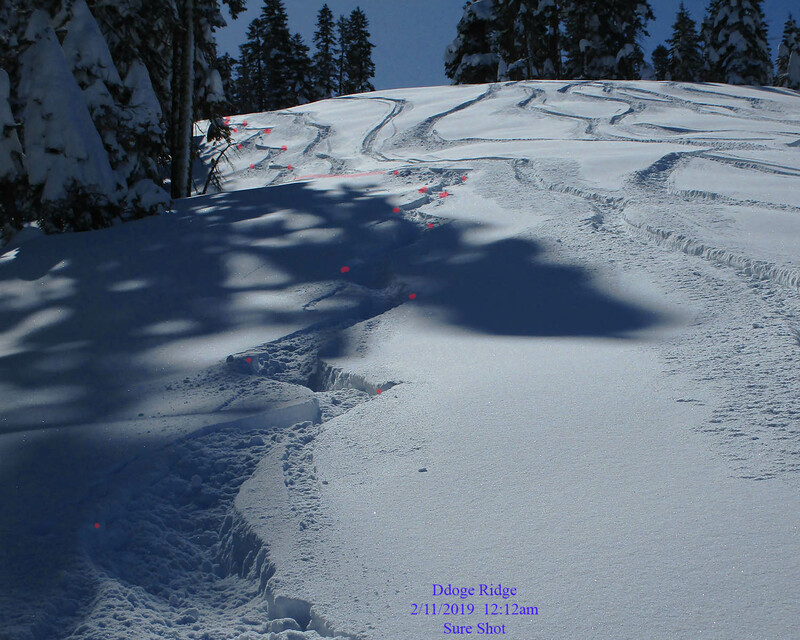 This image above was shot from the chair on my next lift ride up and shows how quickly slopes track up as just a few minutes earlier my track was only the second down this slope. And note again how the majority are intermediates or snowboarders that just go straight without turning traversing instead of direct fall lines. About noon the road to The Shots trails opened and I immediately went out to the eastern resort boundary along Sure Shot. 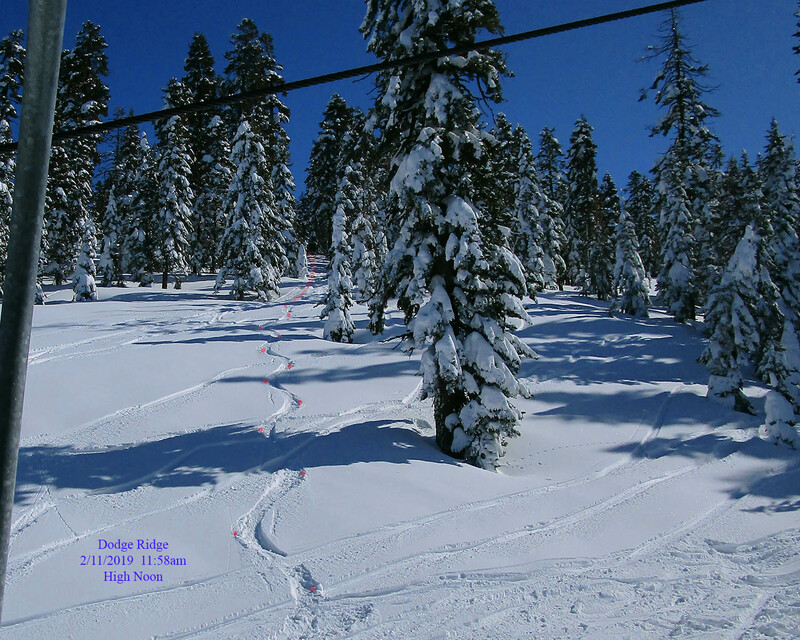 By hiking up several feet above the quickly well tread snowboarder track, I was able to reach this wide open untracked slope taking a picture before skiing off to frame right. This next image above at 12:09pm shows the lower section of that slope where I stopped. My turns higher up are out of view due to perspective. As I put my camera back in my pocket, a few more people tracked down the slope though left me with a nice long line against the trees. I stopped way down to take another shot above showing the lower section of turns. After my next ride up, went down the Skyline road, jumping off at 12:34pm into the forest per image above. 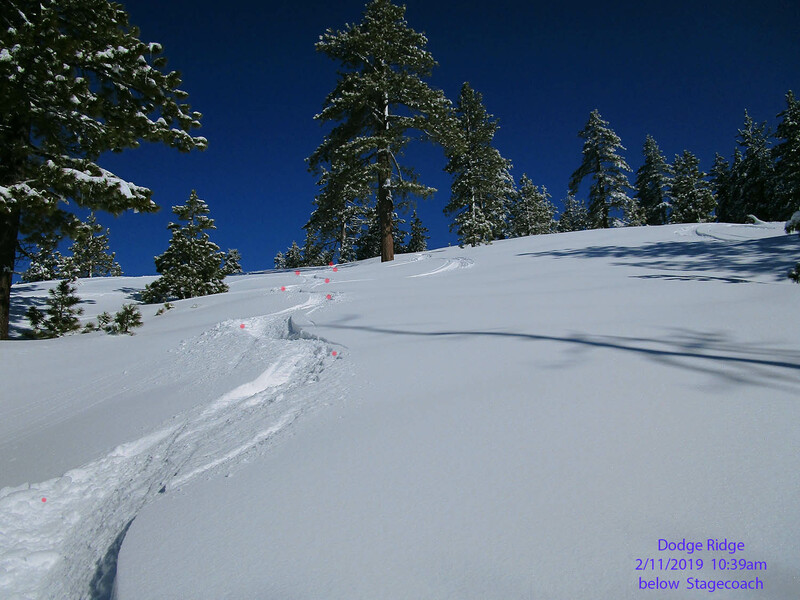 Below that were 2 more nicely untracked low gradient sections. Nearing the Boulder Over road, traversed out to the steep nose of the ridge above the road to an untracked shadowed section I'd spied on the lift ride up. I continued skiing obscure forest areas off Ch 7 and 8 till about 3pm before heading back to the parking lot then driving home. It had turned out to be a terrific day with uncommon light deep snow. I'd enjoyed skiing a lot more untracked lines than the above few I bothered to stop and shoot pictures for. Gas cost plus lift ticket was just under a $100 day well spent. 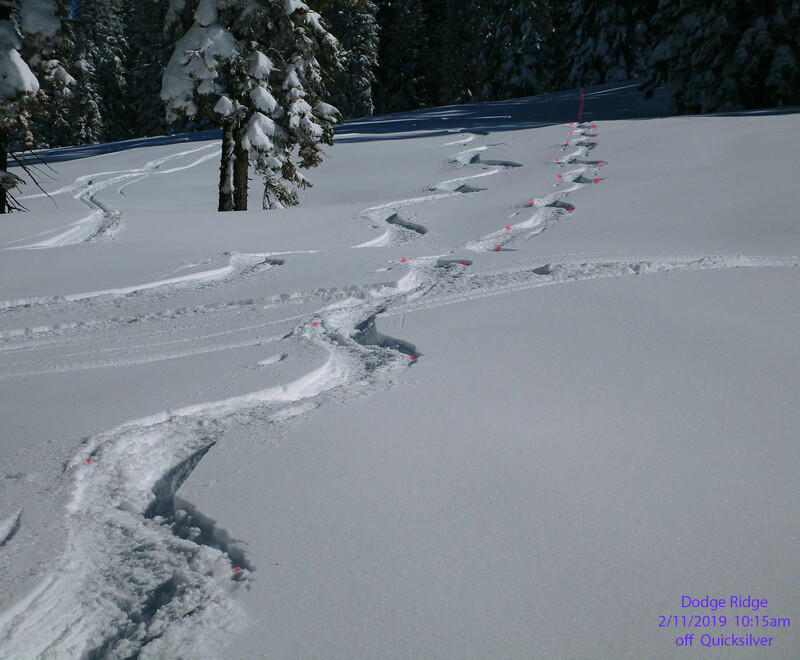 Nice pics....Those look like snowboard tracks not skis-deep powder effect?